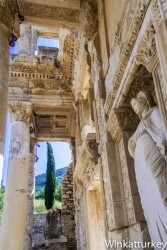 During year 2015, UNESCO will announce whether Ephesus is finally included in the World Heritage list. 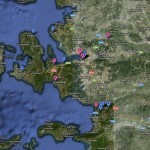 This amazing city is the most visited archaeological site in Turkey. Two million people walk its streets every year and the number continues to rise. Turkish authorities have put all their dedication to get the distinction that recognizes the merit of many years of work in the ruins of this ancient city that was present as few others in our history. This post about the most famous monument in Ephesus is our modest support to finally get his name included among the places that deserve to be preserved as an example of our past and culture. The library was built between 115 and 120 in honor of Tiberius Julius Celsus Polemaeanus, Roman proconsul of Asia Minor, by his son Gaius Julius Aquila. 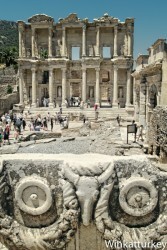 The building was both library and memorial, since inside it was deposited the sarcophagus of Celsus. Both the work and the initial purchase of books were met with donations 25.000 denarius worth made by Celsus´ son, although his grandson continued to contribute financially to the Library. The impressive façade of two floors uses advanced architectural techniques to increase the sensation of greatness. For example, it is built with a convex shape and the columns are of different size. The marble-paved square located in front of the Library is the most emblematic place of the city. The library had capacity to 12.000 rolls and was among the largest of its time, as it could be expected from the most populous city in Asia and one of the most important of the Empire. The central room where the books were deposited was 16 meters high. To avoid moisture and high outside temperatures, it was built with double walls that allowed air circulation between them. 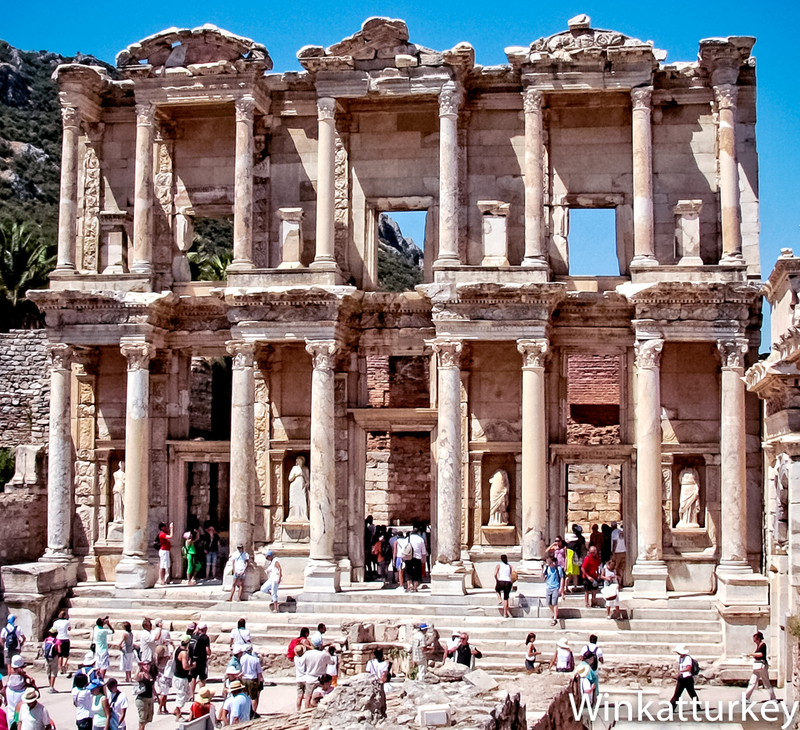 Following the custom of the time the books were read outside and today we can imagine the feeling of those Ephesian citizens when we sat on the marble steps overlooking the square in front of the Library. From there we contemplate the Avenue of the Curettes with its temples and also the Mithridates and Mazaeus gate that communicates with the Agora. 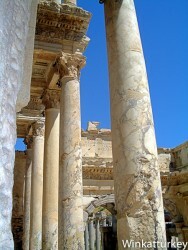 The library suffered two fires and stopped working about the fourth Century. Thanks to the work of the Austrian Archaeological Institute today we can enjoy the reconstruction of this magnificent building which is worth the visit to the ruins of Ephesus. Ana, finally we've listened and we've encouraged to go to Turkey this summer. A pity that we could not go when were you there, but better late than never. 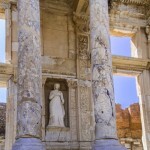 We loved Ephesus and we thought of returning to Turkey as we can. I understand that it is a country that I love and that has been led to this great blog. Keep up the amazing work, I will continue with enthusiasm. It is an amazing country full of exotic blends and many contrasts. As glad Patri, I knew that I would love and certainly not you were able to discover all the wonders that hide the country. The next trip we organize together.